Is there another automotive name that’s so evocative? So bristling with passion and performance? So steeped in motoring and motor sport history that hearing it spoken in a gravelly, Italian accent makes the hairs on the back of your neck stand to attention? Whether we love or loathe Ferraris – indifference to them simply isn’t an option – the sight of one remains a special event; one that makes you suspend life to absorb its presence before continuing on your way. Such is the exclusivity afforded by small production numbers, only the select few are fortunate enough to regularly cast their eyes across a Ferrari’s form. Fewer still have the privilege to have driven one. Just 48 hours earlier, Brands Hatch had been a hive of frenzied activity, with waspish engine notes from the British Touring Car Championship reverberating around the natural bowl that the Indy circuit wends its way around. By the Tuesday, the skies were clear, the air bitterly crisp, despite the calendar confirming it was April, and the atmosphere hushed in anticipation of the mechanical ferocity that was about to be unleashed. Snarling across the start-finish line of the Brabham Straight ripped one of Ferrari’s most revered cars, not just of its contemporary range, but of all time. 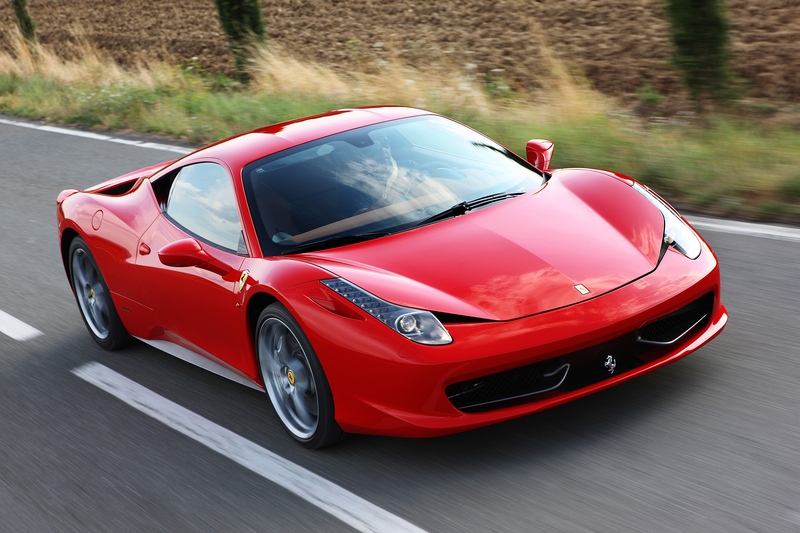 The delectable 458 Italia. Whilst styling is always subjective, it’s relatively easy to argue that with the 458, Pininfarina has created a masterpiece. Graceful curves and functional detailing create a fascinatingly simple-looking example of automotive beauty. Yet every crease, scallop and duct serve a necessary aerodynamic purpose, pressing the Ferrari into the ground as its velocity increases. Things have come a long way since the F40’s enormous, downforce inducing rear wing. Nestling into the embrace of the carbon fibre racing seats swathed in grippy Alcantara, you’re struck by how easily everything falls to hand. Even though form follows the function of ergonomics with all the switchgear barely more than a finger reach away, there’s a beauty and richness about the materials and their appearance. It’s more than just the historic script across the rear engine cover and the Scuderia shield badges on the front wings (incidentally, an optional £1014 extra) that links 458 Italia drivers to their scarlet-suited Formula 1 counterparts. You’re forced to adopt a reclined seating position similar to that of a racing driver; your hips further forward than in the majority of cars, yet the wheel and pedals are perfectly positioned. And what a wheel it is, reminiscent of the one in Alonso’s hands as he carved his way to victory at the recent Chinese Grand Prix. Not that Fernando has indicators and windscreen wiper buttons to concern himself, but the link is tangible, not tenuous. 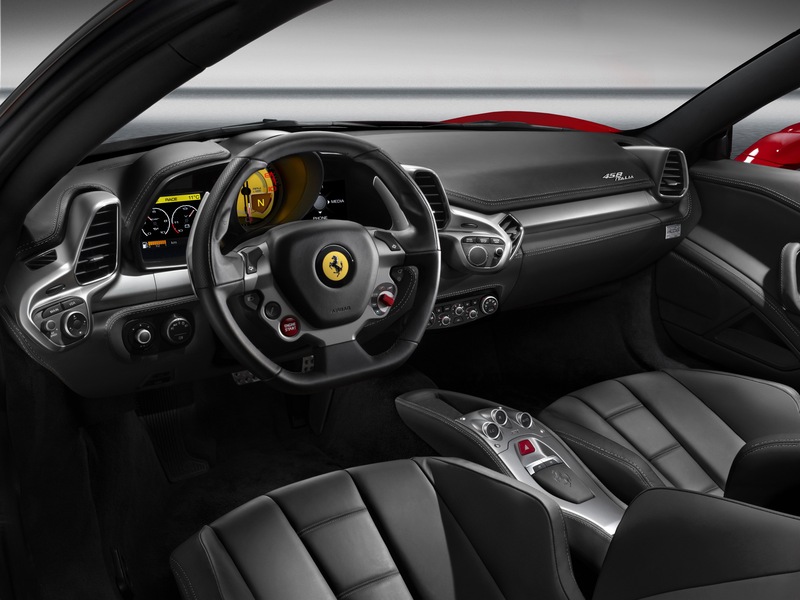 Behind the wheel lie the gear lever paddles which actuate precise and immediate shifts between the seven gears of the double clutch transmission. Purists may grumble that this isn’t ‘real’ but Ferrari knows what its customers want and that is the link to the pinnacle of motor sport. That the Scuderia first debuted the paddle system in race form back in 1989 says much about how slow a process acceptance of change is for some. Install steering wheel paddles in most cars and they’re little more than frivolous novelties you soon tire of, opting instead to leave the selector in automatic. The 458 has a self-shifting mode too but doing so misses the point. Drive the Italia changing ratios manually and it immediately seems like second nature; more fluent a driving experience than stiring a stubby lever through the H-gate with your left hand. Upchanges are auctioned without a break in performance, whilst downchanges are accompanied by a satisfying throttle blip, the teeth of the Ferrari’s fearsome grunt almost visible at the exits of the trio of exhaust pipes. 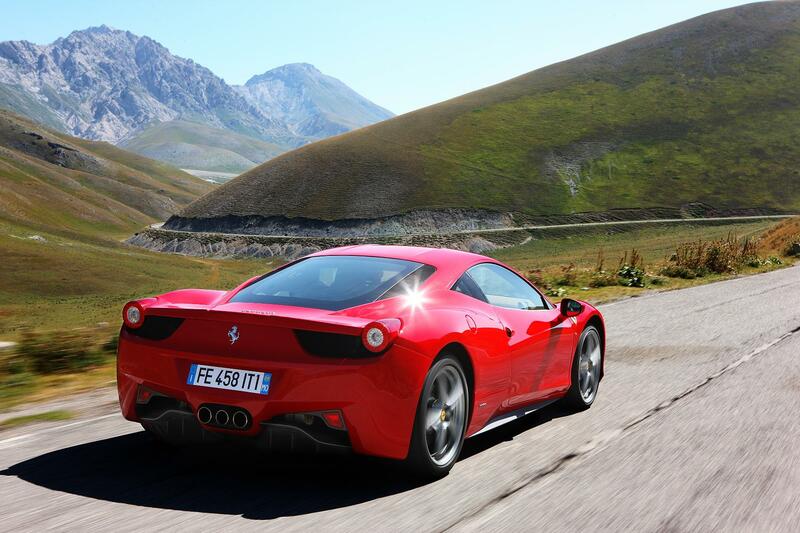 The performance on offer is searing without being savage, such is the forgiving nature of the 458 even in ‘race’ mode. Sweeping off Brands’ Clark Curve and along the main straight, 120mph is easily passed before the prodigious stopping power of the brakes scrub off enough speed to power down Paddock Hill Bend. Don’t be lulled into a false sense of security. It’s playful and would snap you backwards into a guardrail if you didn’t show it respect. Nurture your relationship with it, caress it and tease the throttle opening and steering wheel angle into bends and you’ll be rewarded with a handling balance that makes you look and feel like a hero. Road cars rarely feel special on a race track. The fact that the Ferrari 458 Italia feels so at home on the circuit yet is impeccably forgiving and encouraging bodes well for its undoubted brilliance on the way back home too. 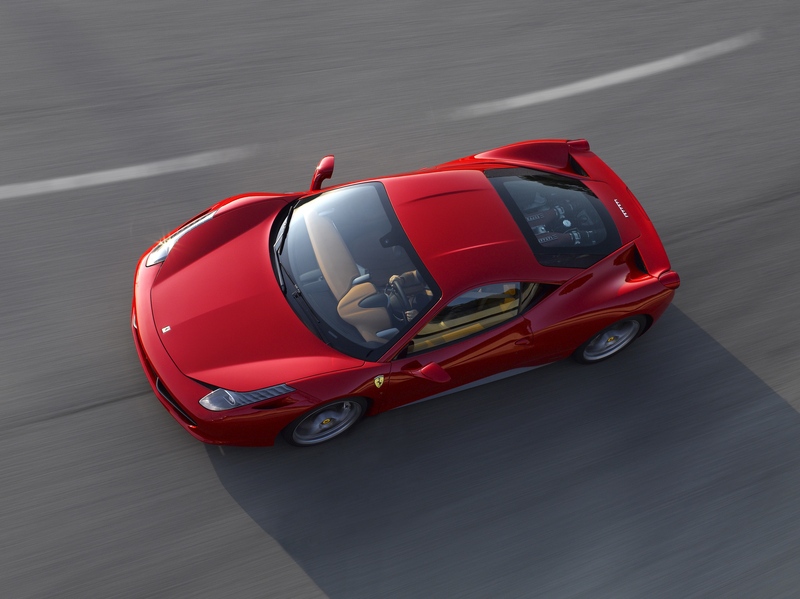 Ferrari’s 458 range starts at £178,491 for the Italia coupe rising to £198,936 for the Spider version.